Get creative with our 48mmwide printed ribbons. Satin ribbons printed in Essex, our ribbon printing service can print on our beautiful satin 1.9 inch wide ribbons. custom printed and ideal for gift wrapping, trophies and promotional this beautiful silk to the touch satin ribbon is luxurious and prints wonderfully in a huge variety of colours. 48mm wide printed ribbon, printed ribbon in the UK by Personalised Printed Ribbons are beautiful satin ribbons that can be printed with your own design of text and/or logos. The 48mm wide ribbon is ideal for gift wrapping, Sporting Trophies, Hampers & Promotional Events. We offer standard printing for decorative applications, a shiny print for festive wrapping and a specialist waterproof option suitable for gentle machine washing. Personalised printed ribbon 48mm wide, this wider printed ribbon is perfect for larger gifts and events. This beautiful satin printed ribbon produces a beautiful finish and can be pre-cut to your own print lengths if required. Our printed ribbons are produced here in Essex by our ribbon printer and we can offer a next day service if necessary dependent on stock. 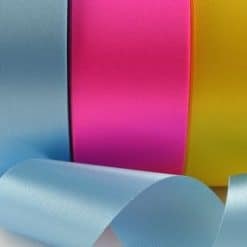 The single faced satin material allows this 48mm or 2 inch wide ribbon to be ideal when a slightly stronger ribbon is required, it's satin texture ensures a high quality print finish.Our ribbon is extra smooth with a slit edge on the ribbon which prevents fraying and gives an excellent quality print.